Oscar Wilde-witty raconteur, flamboyant hedonist, and self-destructive lover-is most familiar as the author of brilliant comedies, including The Importance of Being Earnest , An Ideal Husband , and the decadent novel The Picture of Dorian Gray . 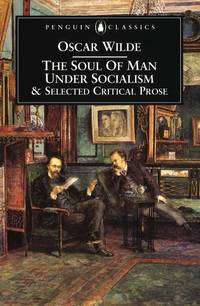 This selection of critical writings reveals a different side of the great writer-the deep and serious reader of literature and philosophy, and the eloquent and original thinker about society and art. This illuminating collection includes "The Portrait of Mr. W. H.," "In Defense of Dorian Gray," reviews, and the writings from Intentions (1891), including "The Decay of Lying," "Pen, Pencil, Poison," and "The Critic as Artist." Penguin Publishing Group, 2001. Paperback. Acceptable. Disclaimer:A readable copy. All pages are intact, and the cover is intact. Pages can include considerable notes-in pen or highlighter-but the notes cannot obscure the text. At ThriftBooks, our motto is: Read More, Spend Less.Dust jacket quality is not guaranteed. Penguin Classics, 2001. Trade Paperback. Good. Softcover. Sound & good copy, light to moderate rubbing/edgewear to wraps. Penguin Classics. PAPERBACK. 0140433872 *BRAND NEW* Ships Same Day or Next! . New. Penguin Classics. PAPERBACK. 0140433872 *LIKE NEW* Ships Same Day or Next! . Fine. Penguin Classics, 2001-11-01. Paperback. Good. 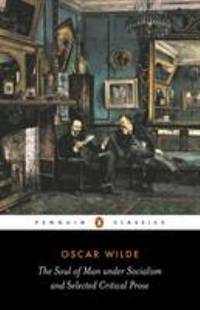 Wilde, Oscar/ Lowling, Linda (EDT)/ Dowling, Linda C.
Penguin Classics. Literature & Fiction. New. Penguin Classics Brand New: This item is brand new unopened, never used and still in its original manufacturer condition. Penguin Classics. PAPERBACK. 0140433872 Brand New ,Original Book , Direct from Source , Express 5-8 Business days worldwide Delivery. . New. Penguin Classics, 2001-11-01. Paperback. Used:Good. 2001-02-03. Good. Ships with Tracking Number! INTERNATIONAL WORLDWIDE Shipping available. May not contain Access Codes or Supplements. May be ex-library. Shipping & Handling by region. Buy with confidence, excellent customer service! Penguin Classics, 2001. Paperback. New. 7.8 x 5.15 cm. Penguin Classics. PAPERBACK. 0140433872 Like New Condition. . Fine. Penguin Classics. PAPERBACK. 0140433872 New Condition. . New.